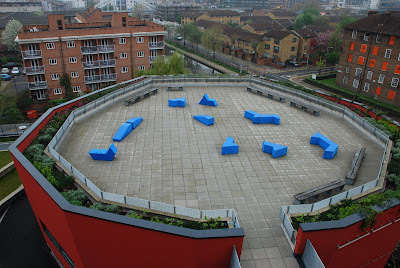 Gareth Long - Education: Using the roof as a learning space - why not? There is a move in a few new schools (primary and secondary) to use the roof as teaching, learning and socialising space, here and abroad. Whilst not a major trend, this is sometimes true in schools being developed in tight urban spaces - and why not? The roof is a large area that usually serves only one function but so much more can be done with some creative and innovative thinking. 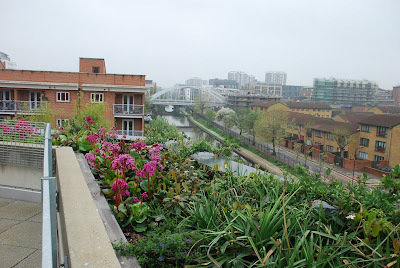 The photographs in this post are again of the Bridge Academy in Hackney, (see post below) showing the roof garden on top of the performance centre. 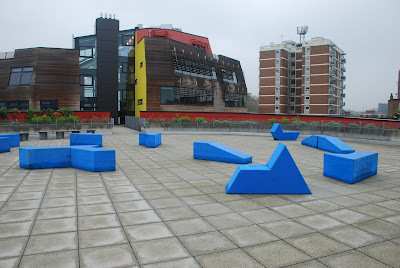 The space is also enhanced with some rather funky outside furniture which encourages multiple use. It is being used as a teaching space, but opportunities for art, drama, dance, geography, history, local community awareness all spring to mind. In addition, as a unique venue in that area, with opportunities for school, community and borough functions and events - the potential is enormous. The view, albeit urban is fascinating and many boroughs and landmarks are visible. It is a great resource. There will be the usual concerns about health and safety, but as can be seen, smart design has allowed higher than normal rails, extensive planting and so on has created a wide (and high) barrier whilst maximising the uses of the space. And yes - there obviously does have to be effective supervision, as every school space requires (this sentence has only been added only written as someone has already asked!). Does it does add cost to a build programme, yes, but does it bring additional value to the learning opportunities - surely yes again? If we really are to build creative 21st century learning spaces that maximise use of the building maybe we should all be looking up and at least thinking about the roof as another opportunity. i'm sorry, but i do believe that the person who thought of this is completely mad. Pupils will see it as a challenge to be the first one to free fall from the roof and it scares me to think of taking a group of pupils out into such a learning space. How the hell do you risk assess this!! Just as an fyi: a number of new schools in the UK are now developing roof areas, both primary and secondary. This is especially true of those in very dense urban settings.